I'm not much of a dessert person, but there are certain things that hit certain spots for me. The combination of orange and chocolate is one of them, going back to a childhood fondness for the mandarin chocolate sherbet at Baskin Robbins (the flavor was discontinued many years ago, but memories persist). So when I see a dessert with orange and chocolate, I have trouble not ordering it. 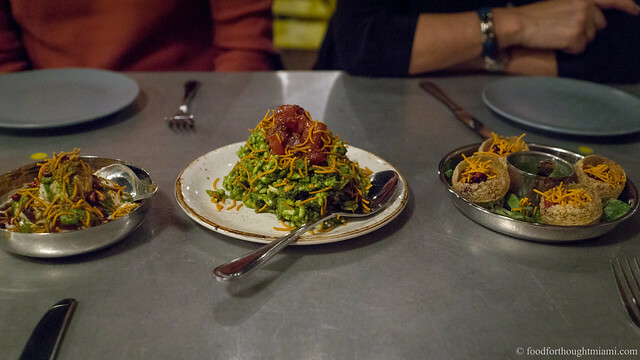 Somehow I missed it on my first visit to Pinch Kitchen, a new-ish restaurant opened up on the northern periphery of the "MiMo District" along Biscayne Boulevard by a couple Pubbelly alumni, John Gallo and Rene Reyes. 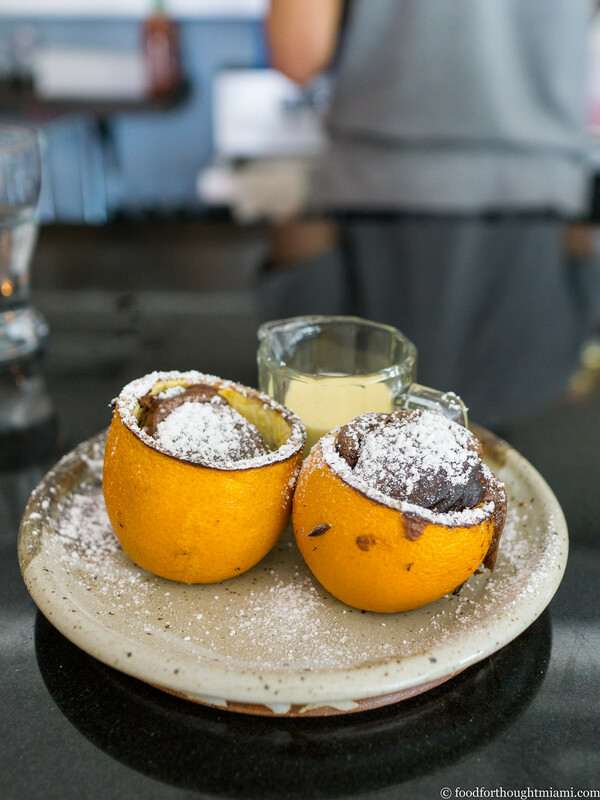 But their short list of desserts includes an orange and chocolate soufflé, baked right inside hollowed out oranges, and served with a classic creme anglaise. I went back for brunch this weekend to try it (and a couple other things). The soufflé is airy and light but intense with chocolate flavor, drawing some extra citrus perfume as you scrape your spoon across the inside of the orange skin. I don't know if Baskin Robbins is ever bringing back mandarin chocolate sherbet, but this is a good substitute. Also very good: a wahoo tartare from the daily specials at Pinch, given some tangy brightness from a fine brunoise of fresh peach, and some zing from fresh red chiles. (There are a few more pictures in this Pinch Kitchen - Miami flickr set).